Today’s AM fix was USD 1,237.25, EUR 908.61 and GBP 757.19 per ounce. Yesterday’s AM fix was USD 1,238.00, EUR 908.56 and GBP 753.91 per ounce. Gold fell $2.80 or 0.23% yesterday, closing at $1,240.60/oz. Silver slipped $0.04 or 0.2% closing at $20.15/oz. Gold prices are marginally lower again today in most currencies. Gold is more than 1% higher in Australian dollars after a very poor jobs number in Australia raised concerns about Australian asset bubbles and the Australian economy. The Aussie dollar has fallen by 4.4% against gold so far this year. Technically, gold is looking sounder. Support is at $1,220, $1,200 and of course what appears to be a double bottom at $1,180/oz. A close above $1,270 could see gold quickly move to test resistance at $1,300 and $1,330. The supply demand fundamentals of the gold market remain sound with the flow of gold from West to East. 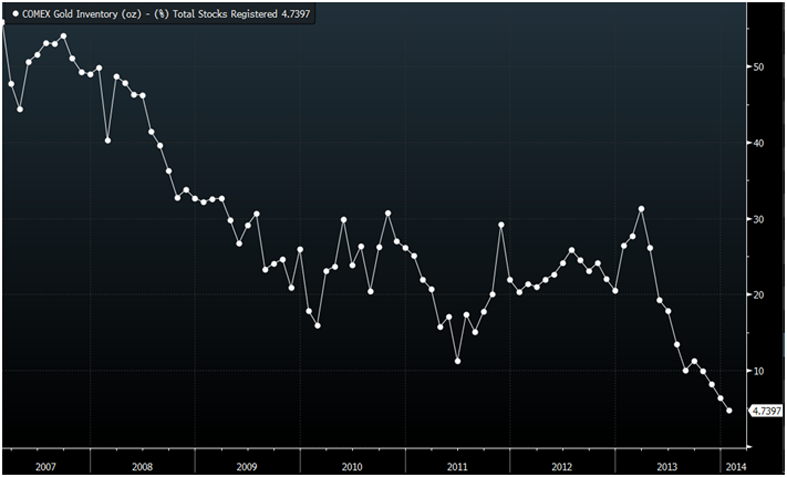 COMEX gold stocks have fallen to new record lows (see chart) showing demand for physical bullion remains very robust. Indeed, the scale of the fall in COMEX gold stocks since 2007 and which accelerated in early April 2013 is important to note. 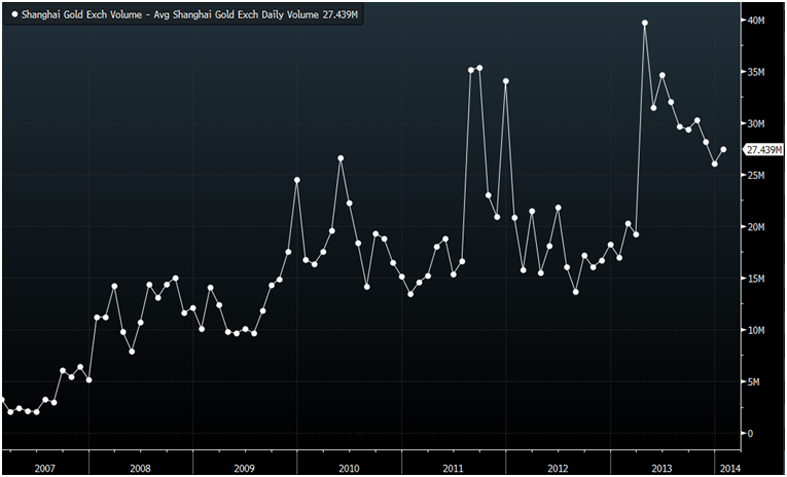 Conversely, on the Shanghai Gold Exchange (SGE), volumes surged in the year 2013, particularly since the peculiar, sudden price drop in April and volumes traded surged 61% year on year. The London bullion market has seen intermittent shortages of 400 ounce gold bars. Traders said the shortage of London Good Delivery Bars was pushing premiums for physical delivery for 400 ounce bars as high as 50 cents. Physical buyers view the 28% sharp sell off in 2013 as an opportunity. They continue to accumulate on prices below the $1,300 per ounce level.